What if you had the ability to triple your reading speed, accelerate your learning, memorize more in less time, Stay focused, ignore distractions and interruptions whenever you needed to, be more productive and achieve more success? In this fast-paced world "Time is Money". Speed reading skills increased comprehension, and the ability to recall what you've read can be invaluable! 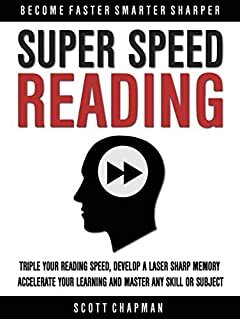 Speed reading used to require months of training but In “Super Speed Reading” you’ll learn with step by step instructions that will have ANYONE reading much faster in just one hour, and we GUARANTEE it! Just follow the simple techniques and you will begin to see a difference in your reading speed, memory and your learning. In fact, you can easily improve it so dramatically that it will change your life forever. You often find yourself thinking about other things when reading, And have no idea what you just read? If you hate to study and want to get more out of your study sessions? Yes, with this revolutionary book you’re about to have exclusive access to, you’ll be able to blow through entire novels in an hour or less…..And remember everything that you read. Take action now and download this book for a limited time discount!